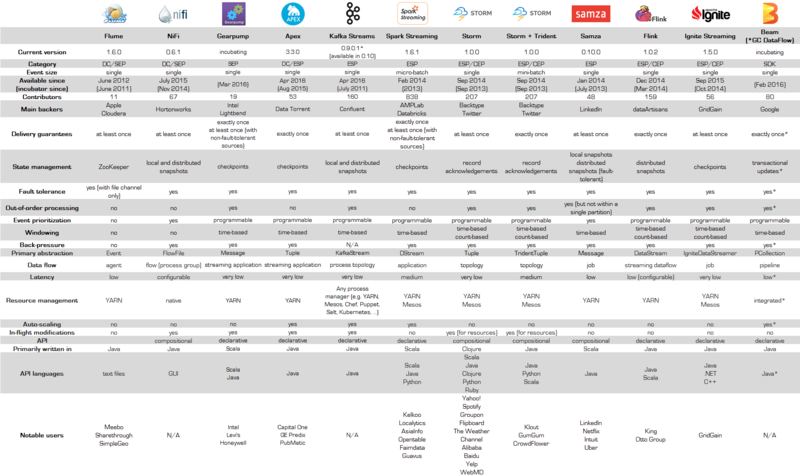 We recently came across a valuable summary of a dozen modern open source technologies for processing event streams (see the chart here). We have not been able to track down the author, but we owe her or him thanks for compiling this chart. Seven of these platforms, specifically those categorized as providing “event stream processing (ESP)” and/or “complex-event processing (CEP)”, support the development and deployment of stream analytics (i.e., event-processing logic for generating complex events from input (“base”) events). The rest address other aspects of event-stream handling such as data ingestion. These twelve technologies are leading examples of the richness of today’s open source event processing software. Not all will survive in the rough and tumble world of software, but some are likely to endure for years, and a couple may evolve and be running ten years from now. These technologies are an alternative to the two dozen commercial event-processing platforms that compute complex events using high-level event processing languages.